Islamabad Leopards scripted a stunning turnaround by recovering from being bowled out for 54 in the first innings to crush Multan Tigers by 303 runs at the Multan Cricket Stadium. The win was built around a double-century from Imad Wasim in the second innings, and a 10-wicket match haul from the fast bowler and Leopard's captain Zohaib Ahmed. After being inserted, Leopards were dismissed in 14.1 overs, as Mohammad Asif collected a career-best 8 for 19 to wreck the line-up. Tigers, however, hardly fared any better themselves, as they were bundled out for 121 in 35 overs, thanks to four-wicket hauls from Zohaib (4 for 51) and Hamza Nadeem (4 for 41). Still, Tigers had a 67-run lead, and with Leopards precariously placed at 147 for 5, it seemed as if only result was possible. However, Ali Sarfraz scored 71, and a 323-run partnership for the sixth wicket between Faizan Riaz and Wasim lifted Leopards to a mammoth 575. Riaz struck 23 fours during his 158, while Wasim's 207 featured 27 fours and a six. Sadaif Mehdi took five wickets for Tigers, but conceded 158 runs in his 35 overs. Set a formidable 509 for victory, Tigers lost wickets at regular intervals to eventually be skittled for 205 inside 54 overs. 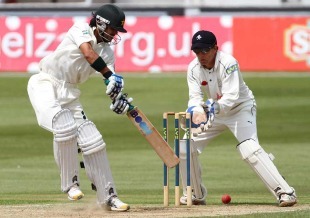 Kashif Naved (60) and Gulraiz Sadaf (74) raised fifties, but only two other batsmen managed to reach double digits, as Zohaib's 6 for 80 and Nadeem's 4 for 77 sealed a famous win for the visitors. A nine-wicket match haul from debutant Mohammad Asghar and centuries from Mohammad Nawaz and Fawad Alam took National Bank of Pakistan to a nine-wicket win over Zarai Taraqiati Bank Limited in Karachi. Having chosen to bowl, National Bank bowled out ZTBL for 323, with Asghar picking up five wickets. Shahid Yousuf top-scored for ZTBL with a 214-ball 115, an innings that contained 17 fours. In reply, National Bank declared on 416 for 9, with Nawaz scoring 102 and Fawad, dropped from the Pakistan ODI side, making a 242-ball 164 with 15 fours and a six. ZTBBL crumbled in their second innings and were bowled out for 162 with opener Zohaib Khan carrying his bat for an unbeaten 170-ball 64. Nawaz was National Bank's most successful bowler again, with figures of 4 for 57 in 22 overs. Left to chase 70, National Bank got there in 18.2 overs for the loss of one wicket. A 14-wicket haul from Shahzaib Ahmed helped Karachi Dolphins achieve a crushing ten-wicket win over Peshawar Panthers, who never recovered from a first-day collapse. Having chosen to bat, Panthers were bowled out for 86, with the legspinner Shahzaib finishing with figures of 6 for 24. Dolphins got past that total with only one wicket down, and went on to score 340, with each of their top nine getting into double figures. Two of their batsmen made half-centuries, with Yasir Mushtaq scoring 60 at No. 3 and Babar Hossain striking a 109-ball 82 at No. 7. Panthers batted resolutely in their second innings, with opener Ashfaq Ahmed scoring 96 and captain Akbar Badshah making a patient 64, but they needed much more to overcome their first-innings deficit of 254. Shahzaib chipped away at the wickets again, and finished with eight for 122 from 40.2 overs. Left to chase 57, Dolphins got there in a mere 7.2 overs, without losing a wicket. United Bank captain Ali Asad scored his tenth first-class century in the second innings, but it was his first-innings 91 that was the critical innings in their drawn game against Water and Power Development Authority. United Bank were bowled out for 277, Mohammad Irfan taking his maiden five-wicket haul in only his second first-class match. But then United Bank's left-arm seamer Rumman Raees ran through the WAPDA top order to help his team sneak a 65-run lead. Ali Asad's 150 in the second innings led United Bank to 284 before they declared to set WAPDA a target of 350. With Ayaz Tasawwar and Aamer Sajjad hitting half-centuries in the last innings, the game ended in a draw. United Bank took three points for the first-innings lead. A run-glut in the second innings came a bit too late for Sui Northern Gas Pipelines Limited as they walked away with zero points in a drawn match against Port Qasim Authority, as they had conceded a lead in the first innings. The clincher happened to be a crucial 47-run last-wicket stand between Port Qasim's Daniyal Ahsan (55) and Sohail Khan (21*) that helped the team overtake Sui Gas' 278 to take the first-innings lead. Sui Gas' responded with opener Naeemuddin hitting an unbeaten 211 - his fifth century in the last seven games - while Azhar Ali (154) and Ali Waqas (104) registered their respective centuries too to lift the team to 539 for 3 at the end of the game. However, it was Port Qasim who walked away with three points.